I decided that I would make some books using historic book structures that I don't use very often. 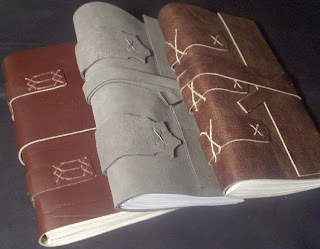 So I started by making three blank journals based on the 16th Century ledger binding that I learned in a bookbinding class with Susan Mills, and as described by Szirmai in his text The Archaeology of Medieval Bookbinding. These ledgers were typically made with limp covers that were attached to the textblock with tackets and/or leather lacing through overbands on the outside of the cover. Hmmm, there are a lot of reasons why my books are nothing like the ledgers from the 16th Century, but I did try to use the same basic techniques for the book construction. I sewed the signatures onto leather strips. 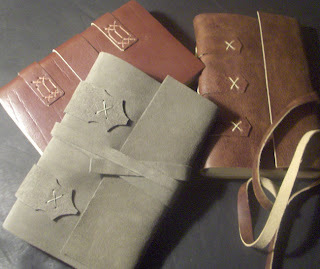 Then I attached the leather covers by weaving the leather strips through a couple slits on either side of the spine. I cut out the overbands and pasted them in place, covering the leather strips that were woven into the cover. The overbands are stitched at each end and there are tackets on the spine for additional reinforcement. The dark burgundy book has some X and line stitching on the overbands that is kinda like some of the stitching I've seen in photos of these old books. The others have just plain X stitches. The dark burgundy and the brown books both have tackets on the spine which provide additional security to the binding and cover attachment. I cut the grey overbands a little fancy smancy and decided that I wouldn't put tackets on the spine, just because I think it looks better this way. I am in LOVE with these. I'm new to your blog and will look forward to checking out more of your stuff. Thanks for sharing!